As a photographer, one of my BIG interests has been working with high school seniors and teens. I just love their energy, their willingness to succeed and learn, and their excitement about the experience of working with a photographer! I started a senior representative program to help me market my business to high school kids. With my 13 years of experience as a researcher, I also love the idea of having a rep program because I can use my reps as key informants–they can provide me with their opinions about what’s cool, what’s not, and what their peers want in a photographic experience! Meet Tyler from Scarborough High School! He is going to have a special place in my heart forever because he’s my very first senior rep! I met Tyler from his awesome Aunt Julie, and I’m thrilled she sent him my way. Tyler was a gentleman who insisted on carrying my ladder for me. (Yes, I carry a small ladder with me on shoots because I’m 5’2″ and like to have the opportunity to be at eye-level with my clients!) I had instant respect for Tyler because he was joined on his shoot by his aunt, uncle, and two lovely grandmothers. A close-knit family is so special, and it was a joy to see them interact. I also love that Tyler is planning to go into law enforcement after high school. Just during our brief time together, I can tell he is a reliable, honest, level-headed, big-hearted guy–great qualities for a future police officer! Tyler told me at the end of our session that he had a good time, that it went by really fast, and he told me I was “chill”. Seriously, as a photographer being told by a teenage guy that a photo shoot was fun and moved quickly is a great compliment–and as an almost 35-year old woman, being called “chill” is kind of AH-MAZING! Tyler, you made my job easy. I’m so proud that you will be representing my studio during your senior year! 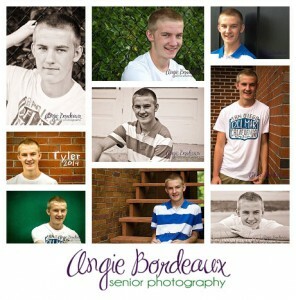 If you are as awesome as Tyler, are a member of the class of 2014, and live in southern Maine, please apply to be a senior rep at www.angiebordeaux.com! Awesome job!! Can’t wait to hang one those pics on my wall!!! Trying to decide what to wear for your senior photos can be a tough decision! The options are endless, but seemingly impossible all at the same time, right, ladies?! 1. Don’t be someone you are not. Your senior photos should reflect who you are at this moment in time (in my humble opinion!) so don’t wear something you don’t like just because it’s trendy. You should be comfortable with what you’re wearing and feel good about how you look! 2. Wear layers for more variation. You’ll get more “looks” without having to do a full wardrobe change by easily removing a blazer, sweater, or jacket. I promise if we’re doing a session on a warm day, we will move quickly to keep you from overheating! 3. Accessorize! If you enjoy jewelry, hats, scarves, and other fun accessories, this is your time to bust them out! They give your photos a new dimension and, often, a fun pop of color. 4. Seek the advice of a fashionable friend (or your favorite photographer!). Not sure what to wear? Ask someone you trust to help you pick your outfits. A styling consultation is part of all Angie Bordeaux Photography’s Wonderland Collections, so take advantage of the opportunity talk with Angie about your options. 5. Do not spend a small fortune on a whole new wardrobe. Okay, if it’s just a great excuse to update your wardrobe, by all means, go crazy! However, it would make me very sad to think someone felt they needed to buy all new clothes for a photo shoot. Use what you have or borrow items from a friend! If you want to be frugal about your spending, hit up Target, Forever 21, Marshall’s, or H&M. You can get cute clothing and accessories at those places for very little money! Or, go “pop some tags” and visit your local Goodwill or Salvation Army! Lastly, vintage or second-hand shots are awesome for fun retro pieces! I love Find which has locations in Scarborough and Portland. 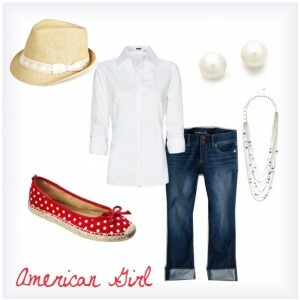 If you need a little inspiration, check out my Polyvore account for some senior girl fashion ideas! Let me know if you have questions or requests! Feel free to comment on your fashion tips for photos. I had a wonderful Memorial Day! I had the great pleasure of working with Natalie & Dakota–a sweet (and gorgeous!!!) couple getting married this August. Our session was at Thompson’s Orchard in New Gloucester where Natalie & Dakota will have their reception. It was a gorgeous, warm day. The apple blossoms were still in bloom despite the several days of rain we had the week before! I can’t wait for August. I have a stong feeling Natalie will be one of the most beautiful brides ever! Thanks for the great session, Natalie & Cody! “Baby, let’s plan on forever and watch all our dreams come true. I can’t believe a whole year has passed since my baby was born! There are no words to express the utter joy she has brought to my life–and I know my husband feels the same. Sammie is amazing. She is hilarious; it’s unreal to me that such a young child can be so aware of what makes others smile. She’s scary smart–she picks things up very quickly. She went from crawling to walking to climbing stairs and running in no time. She says mama, dada, hi, doggy, uh-oh, and kitty. Most importantly, she’s healthy and sweet. She’s growing like a weed and looking less like my baby and more like my little girl. Can you tell I’m totally holding back from getting completely sappy on here!? 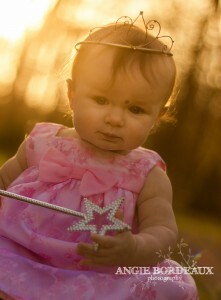 Simply said, she’s my world…and nothing makes me prouder than being Samantha’s mom. On her birthday, we visited a fun place called Greenlight Studio in Portland. Sammie loved it–and Don and I did, too. It’s an indoor play space with enough toys and room to keep the kids fully entertained without being overwhelmed. Sammie immediately found a horse figurine that she carried around for a while. She also found some toy tools in a toolbox and did some construction (she’s daddy’s girl!). She LOVED the fabric/foam blocks they had there (so much that I think we may need to get some for home)! The thing she was most interested in, however, was watching the other kids play. She was quite taken by a cute little guy who was pushing a toy truck while running full speed. Sammie followed him around and was super excited by his “driving” skills. It was a low-key but really fun day after the big excitement of her birthday party the day before. “I’ve been watching you, dad ain’t that cool? I’m your buckaroo, I want to be like you. Welcome to the Angie Bordeaux Photography Blog! This is the place where I will provide tips, suggestions, ideas, and fun bits of information for my clients. 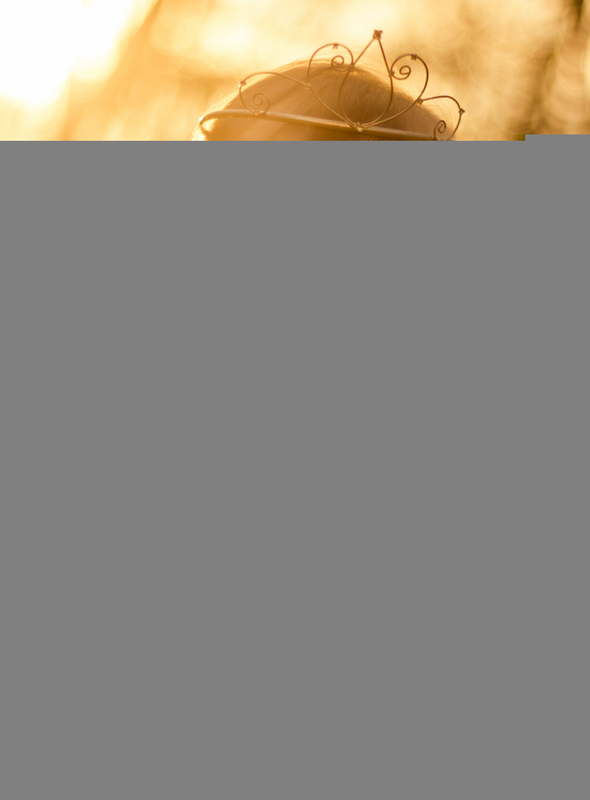 If you have a suggestion for a blog post, let me know by leaving a comment! Even if you don’t have a suggestion, show some love and let me know you stopped by! – Sneak peeks of sessions with my amazing clients! Thanks for your interest, support, and for joining me on this fantastic journey! I LOVE your photos! You’re very talented. The website looks great and I’m looking forward to your blog!